Can I buy a Trabant in the USA? How do I import a Trabant from Germany? These are 2 questions that I have been asked many, many times since the founding of TrabantUSA and due to the time involved in writing individual e-mails, I decided to simply create this online guide. What do you plan to do with your Trabant? If all you want is a display item or something for parts, the rules are different from those of you wanting a Trabant that you can title, register and operate on the public streets of America. 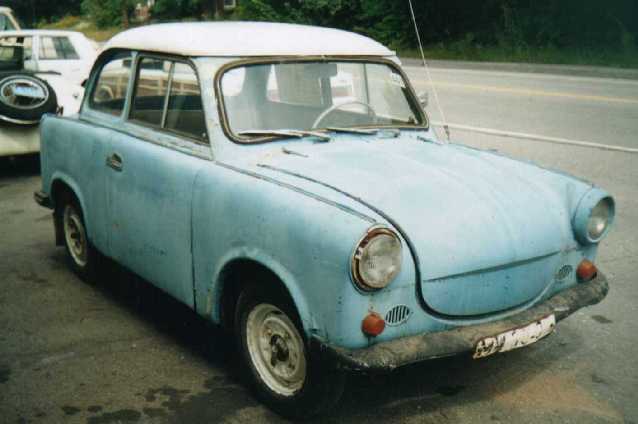 This guide will assume that you are wanting a Trabant that you can actually license and drive. Obviously I can't answer this. Sometimes a Trabant will appear on the market in the USA and you can get a deal that is cheaper than importing one yourself. Sometimes the prices for the already imported ones are such that buying and shipping one from Germany makes more sense if you have the time and resources. Generally speaking, with time and patience you should be able to locate a decent Trabant already in the USA. They do come on the market occasionally across the country, often online. You "should" be able to get a street legal Trabant in good condition in the USA for a few thousand, plus whatever expenses you have in getting it from point of sale to your home. if importing one is your plan, Trabants in nice condition do sell in Europe for under $1000 but of course you will have lots of leg-work, documentation and shipping details to deal with and pay for which will add over $2000 to that amount. PLUS...if you are not already in Germany you will have the added travel expenses too. Where can I look for one already in the USA? Well, the members of TrabantUSA are a great source of imformation and whenever I personally hear of a Trabant for sale I notify all members with the details and contact information. Another unusual but very good source is Ebay! Many of our members Trabants were in fact purchased on Ebay from folks who had one lying about and decided to get rid of it. I search about once a week on Ebay for Trabants. The Hemmings Motor News website also has a Trabant listing now and then. How can I import a Trabant from Germany? This is the question that has no short answer. Assuming you want your Trabant to be legally driveable in the USA, I will not even discuss the rules for importing a non-compliant Trabant for display purposes. if you are going to go to the trouble of shipping one, just get one that will be useable. Your Trabant MUST be at least 25 years old if not older to qualify for EPA and DOT exemptions from US Customs. These Certificates are a MUST and no Trabant without one can ever be licensed, titled or driven in the USA. No Trabant will ever comply with US Department of Transportation Safety Standards or The EPA's Emissions Regulations so the importance of this document cannot be stressed enough! Make sure you get the title (or transferable registration) to your Trabant and that the name of the person selling it to you IS the person on the title. This may sound silly but you'd be surprised how many Trabants changed hands in East Germany without ever being re-titled and often times the only proof of ownership is the Sales Contract. Speaking of Sales Contracts....get one! These can be bought in any German office supply store for about $1.00. Because you are not permitted to title or register the Trabant in your name in Germany, this piece of paper will be the ONLY document you have that says you bought and own the car you are trying to export from the country! Please know something about Trabants before buying one. Just because the car runs does not mean it has a good engine. A Trabant should smoke after long periods of non-use. It should smoke when started until engine is warm and it will always smoke when bearing a heavy load. A good Trabant should NOT smoke 24/7. 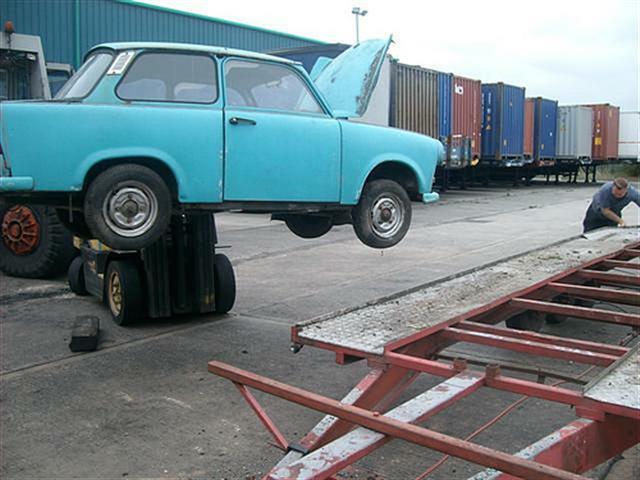 If you're importing a Trabant make it a good one! Replacement engines and parts are available from Germany, but shipping makes these things pricey. Trabants will usually pull gently to one side or another when driven. They may have somewhat squishy brakes that may also pull. They will have a rough, uneven idle when properly adjusted and will sound like they are about to stall but should not. Bring spare parts whenever possible and if you can be so choosey...look for one that has been equiped with electronic ignition.